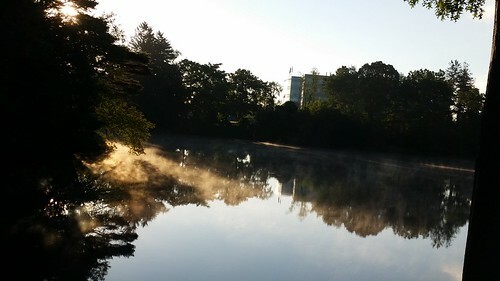 A small pond with the sun rising shining upon it as fog slowly lifts from the surface. When I'm on a run, I really try not to stop and take a picture. This could easily mean resisting at least a dozen shots in any given run. But I like to appreciate my surroundings while running and not actually stop. However, I gave into the temptation for this one. I felt all right with the decision since I was around mile 8 and still have about 4 more to go. I wish I had captured the shot a bit better, maybe going down to the waterfront to shoot it from the water's surface, but I was glad the mist rising from the water was still visible and that the sun also added some interesting color dynamics to the photo.